If only Golden could see America now – how the turntables have turned! Historical irony and The Office aside, it is fascinating to see how some things really do seem to never change. The generation of which Golden refers to as “militant college students” representing “democracy at its entropy” is the very same generation that has turned around and started saying “kids these days this…” and “millennials that…” Granted, the statements I am making are overly generalized, there are certainly many members of older generations who are more than understanding of social issues today, and many so-called millennials who are much less so, but the existence of such sayings at all is reflective of an unfortunate underlying truth – a fundamental fear of relinquishing control and passing the baton to the next generation, and the distrust that goes alongside said fear. Nonetheless, I digress, for the fascinating topic that this Golden article alludes to is that of music as a fundamental part of social movements. As Ray Telford says in his piece in Volume 3 – Issue 13 of Rock2: “[Sedaka] “felt the time was right” for a composer with something to say.” Whatever Sedaka’s motivation at the time may have been, it is worth noting that music, whether it be folk then, or rap now, has been a key part of social movements for a long time. Perhaps Newton could have said: To every action there is always an equal… piece of music? The Runaways in the 1970s. The Runaways were one of the first all-female rock bands in the 1970s. They recorded and performed from 1975 to 1979. The band was formed in 1975 by Joan Jett and Sandy West (rhythm guitarist/songwriter and drummer, respectively) with the help of producer Kim Fowley. After several arrangements of members, the “original” five were completed by Lita Ford on lead guitar, Cherie Currie on vocals and Jackie Fox on bass. Best known for their single, “Cherry Bomb,” The Runaways were not well-known in the United States during the time that they were active, achieving greater success in Japan due to that single and a successful 1977 tour. Shortly after their tour of Japan came to a close before 1978, the band’s lineup as followers commonly know it disbanded with Currie leaving. Throughout the band’s existence, the group has had five different bassists (Micki Steele, Peggy Foster, Jackie Fox, Vicki Blue and Laurie McAllister). Three members remained relatively unchanged: Joan Jett on vocals and guitar, Lita Ford on guitar and Sandy West on drums. The “original five” appear on their first three albums together, and for the final two, West, Blue, Ford and Jett performed as a quartet. Due to disagreements over which direction the band should go in musically, the band split up in 1979. After their breakup, each member went on to pursue their own projects. Joan Jett went on to found Blackheart Records, through which she wrote and performed music as Joan Jett and the Blackhearts as well as helping other artists with furthering their work. Currie is under contract on Jett’s Blackhearts label and spends the majority of her time chainsaw carving after spending years as a drug counselor for addicted and at-risk teens. Ford and West worked on music together for a time that did not come to much fruition and are now involved with their own projects. The Runaways were important to the rock genre because they were one of the pioneering all-female groups in the 1970s. Continuing in the vein of all-female musical acts prior to the 1970s, The Runaways trod into the unfamiliar territory of the male-dominated rock genre, using their sexuality as a mode for making their music accessible and appearing “less threatening” to male listeners as they sang songs about female liberation and rebellion to the pulse of heavy rock. The Runaways were a truly subversive, producing music that fit into an already rebellious genre, they achieved international success in a field that was not immediately welcoming to them while deconstructing the stereotypes the rock music industry had for women breaking into the genre. 1. Lindblad, Peter. “The Runaways’ ‘Cherry Bomb’ gets a chainsaw.” Goldmine (10552685) 36, no. 8 (April 9, 2010): 44-46. Music Index, EBSCOhost(accessed April 21, 2015). 2. The Runaways. Cherry Bomb: Live in Japan. Concert excerpt, Japan 1977. Contrast this with an article from 1977, when The Preservation Hall Jazz Band visited St. Olaf in what the Manitou Messenger calls the “most enthusiastically received concert at St. Olaf.” The Preservation Hall Jazz Band is made up of a pool of musicians that rotate over the years, but was started by Allan and Sandra Jaffe in 1961 New Orleans, who were interested in preserving the traditional jazz style free from commercial imperatives. Becoming famous by touring and recording, Preservation Hall is internationally known and remains one of the popular tourist sites of New Orleans, so of course it was a big deal that they came to our humble little bubble at St. Olaf. 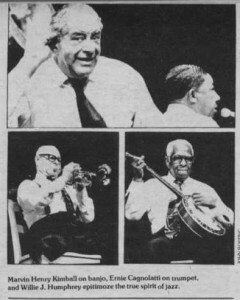 The writer goes on to say that “everybody has heard Dixieland jazz before, but this concert gave us all a chance to see and hear a jazz band doing it the way it was originally done. This style influenced every form of American music since 1900, from Joplin’s rags to Chicago’s rock.” Perhaps due to a lack of curriculum on jazz at St. Olaf at the time, or general lack of scholarship, the writer has a misconception that jazz influenced ragtime, when in reality the syncopated rhythms of ragtime along with the blues style are cited as the origins of jazz. In addition, to assume that the concert of 1977 was a presentation of how jazz was originally done is a pretty bold claim, considering any time a performance claims some kind of authenticity, there are certain details/styles included and excluded. These two examples suggest St. Olaf is not a little bubble, filled with scholarly prowess and immune to the world’s ideals. The stereotypes about the origins of jazz and its perceived development as a “profane” style pervade music history as well as St. Olaf history. We can’t say St. Olaf, as an academic and music institution, was above these problematic notions about Jazz then, so my question is, has much changed? 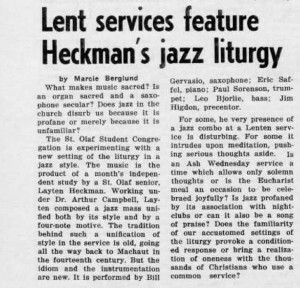 Marcie Berglund, “Lent services feature Heckman’s jazz liturgy,” Manitou Messenger, March 1, 1968. Mike Stiegler, “Original Jazz Preserved for Olaf Audience,” Manitou Messenger, March 4, 1977. As blues gained popularity through publication and performances it became blended with other types of popular music. Blues and rock music were obvious candidates for combination, both drawing on folk instrumentation and sharing similar subjects. In Chicago, which was a hotbed of blues music when many black musicians migrated to Chicago to leave the South. 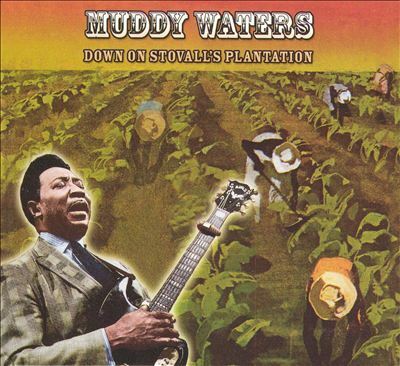 Possibly the most influential musician of the blending is McKinley Morganfield AKA Muddy Waters. Waters got his start at home in Mississippi when Alan Lomax traveled there on behalf of the Library of Congress in 1941 and again in 1942. Waters was later released on the album “Down on Stovall’s Plantation” from these recordings. This recording shows us that Muddy Waters is a legit player of the blues from the south and would be taken seriously by white audiences in the North. In 1943, shortly after Lomax’s visit, Waters moved to Chicago in hopes of making it big as a blues musician. As Muddy Waters made his way as a blues performer he made with friends with Big Bill Broonzy who helped Waters become popular. This article from Cultural Equity highlights some of the connection between Muddy Waters and Big Bill Broonzy. Muddy Waters was put on singles in the late 40s and through the 50s in Chicago. Waters gained popularity from recording Robert John tunes who had been on the blues mind since 1938 from the “Spirituals to Swing” concert in New York (Here’s a short RadioLab episode about this concert and Robert Johnson, it’s great! ).